I opened my tired, sleep-deprived eyes to a beautiful sunrise, waking up the scenery of fields, beautiful houses and forests in the horizon. It was somewhere between 5am and 6am and we were zooming our way towards Krakow, Poland. I shared this train cabin with two strangers, Rachel and two crazy – but awesome – Canadians. I’m not sure when the two strangers joined us. We had laughed, joked and talked until we had fallen asleep. Rachel and I had been worried we would get an awkward cabin, but instead it was perfect. Arriving into Krakow we said polite goodbyes to the strangers. Added our new (crazy) Canadian friends on Facebook (obviously), waited until there was enough space for the two of us to try to retrieve Rachel’s (Gigantic) suitcase from the overhead without knocking anyone out. Walking to the hostel it started to Rain – I was secretly, really annoyed at the rain – it was refreshing, morning due rain, but I really hoped it wasn’t going to rain for the next 4 days. It was early and despite both of us being in a sleep deprived state and totally useless with direction, we made it to ‘Lets Rock Hostel’ too early to check in, but early enough for breakfast and sleeping on the breakfast tables. Sleeper trains do not always mean that you wake up refreshed. We still ‘lost’ the first day to tiredness. Our first day in Krakow was spent napping on the breakfast bar for a couple of hours before then deciding to venture out of the hostel – and let other people enjoy breakfast without snoring – to get money and pick up the boring necessities I had run out of – because you know, this was supposed to be a 3 night trip, not 8 nights – then heading back to actually check in and nap some more. It’s okay to ‘waste’ away a day if that’s what you want to do. Don’t get burnt out trying to fit everything in. Enjoy where you are, even if that is sleeping. Travelling is tiring and some days, even on the shortest breaks, you have to sleep or have a day where you do nothing. There’s no point trying to explore and do things when you aren’t in the right frame of mind to take them in and enjoy them. You’re still in Poland, whether you are exploring the streets or taking a break in a café (for the whole afternoon). There’s no ‘right way’ to travel. Which is exactly what we did. After napping, we went and found a lovely cafe/restaurant, sat outside and stayed there, people watching for the rest of the day – this place became our regular (for 3 days) I think we were here, or ending up here at least once every day. It was only 80 pence a beer…. 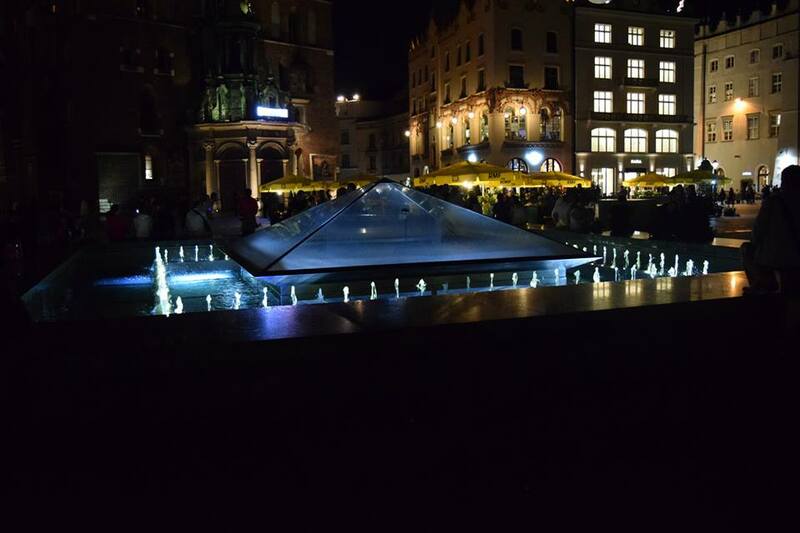 My First impressions of Krakow – Once I had woken up enough to take it in – was amazement. It was simply, one of the most beautiful cities I had ever seen. It was a fairytale city and it made every negative assumption/opinion of Poland I had heard, evaporate. The beautiful cobbled streets, the old styled buildings, castles. Cleanliness and colorfulness of the city was amazing. The whole place just oozed beauty. So far, the people were friendlier than those we met in Prague and it was so relaxed, I didn’t feel ‘unsafe’ for a second. How did people back home get this place so wrong? Before travelling to Poland, whenever I talked about places in Europe I wanted to visit Poland (and eastern Europe in general), was met with funny looks, warnings and negative stereotypes imprinted on people’s minds (by our fantastic media) I would then remind me of the movies such as ‘Taken’ or ‘Hostel’. Thanks. The people I met in Poland were lovely. Very polite, funny, helpful, I never felt unsafe in Poland, I felt relaxed and the city was so laid back, I instantly loved it and could have easily stayed longer. On our second day in Krakow, we spent the day at Auschwitz, it was intense – I will revisit this later for you – and I would highly recommend it to anyone spending time in Krakow. We booked it locally with our hostel and the tour company and the guide was fantastic. It was always somewhere I had wanted to see, it would not have been the same without the guide. I learnt so much and it was a truly, no word to describe, experience. Don’t bother with a Golf Buggy city tour, these tours will set you back more than a full day trip to Auschwitz or the Mountains, and the city tours only last an hour and half! Because we had a limited time in Krakow, these buggy tours seemed very appealing, a lot of people were doing them. But we spoke to numerous different drivers and the cost, was more than a full day trip out of Krakow each and only last an hour and a half – Not worth it. Free maps are available from most hostels and all tourist information points. They are easy to follow – as long as you aren’t completely useless with direction like us – and if you get lost, hey, that’s part of the fun! Getting off the main ‘tourist trail’ in Krakow is beautiful, the old streets, especially in the ‘Jewish Quarter’ are beautiful and filled with character. When wandering on your own you often find things you wouldn’t have even known were there. I mean, did you know Krakow has a walk of fame!? 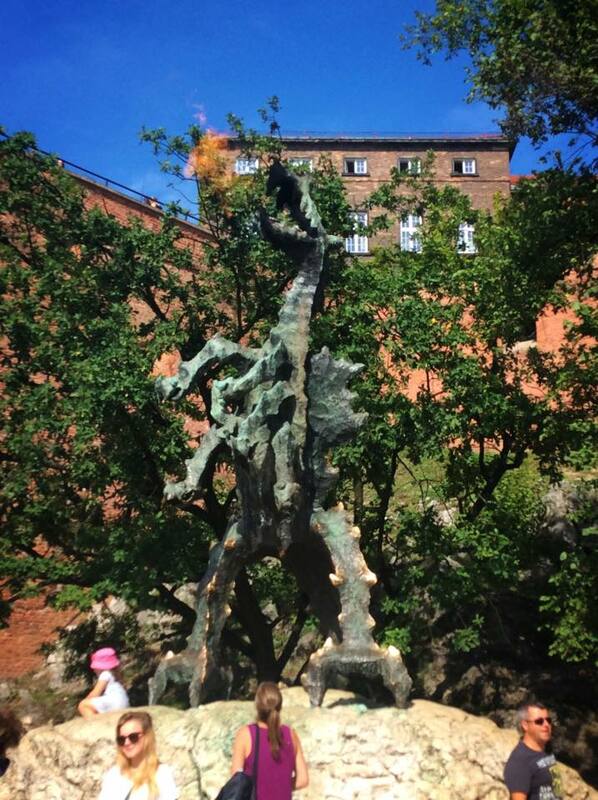 Or a statue of a dragon that blows REAL fire every 10 minutes or so?! Neither did I until we got ‘lost’. If you ever wanted to know what it would be like to be a fairytale princess/prince take a day and let your imagination run wild. Krakow is a fairytale waiting for you, all you have to do is open your eyes and see it. I fell in love with the horse and carts the minute we arrived in Krakow and I saw them lining the streets in Market Square. I wanted to be a princess for a day, ride around in my carriage and do queen waves as we trot past the castle. On our last full day in Krakow I got my wish. We paid $10 each for a 25 minute horse and cart ride around Krakow and it was the most enjoyable thing I had done. We giggled while giving ‘Queen Waves’ to those who we passed and those that stopped to take pictures – of the horses, not us, but it’s fun to pretend – while taking in the beautiful side streets and the views of the beautiful castle. Genuinely I was considering going for another horse and cart ride in the evening. I loved it. 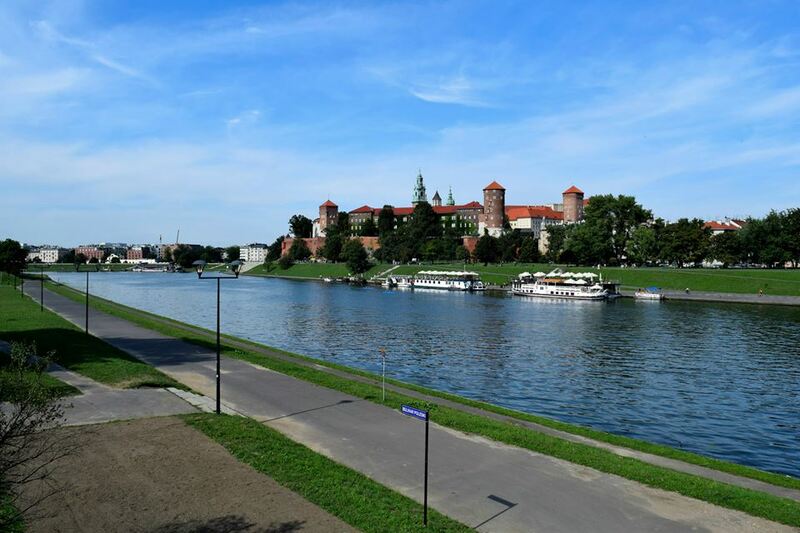 Wandering the grounds of the beautiful Royal Wawel Castle, soaking up the sun, eating ice cream while imagining what it must have been like to once up-on a time live in a castle and been so royal. After wandering around pretending to be Princesses, we decided we should probably try to see a little more of Krakow. So we headed out in search of the Jewish Quarter – because we are useless with directions, searching, even with a map, is the word – we wandered into the Jewish Quarter, found a cemetery – which I’m pretty sure was not the one of the map, but we counted it – and visited the Oldest Synagogue before calling it a day – the beating sun takes a lot out of you, especially in a heat wave – and returned to our ‘local’ café/pub for some more 80 pence beers. Our Hostel was just off Market Square and the cafe which became our regular was just up a little street from here, it was perfect. Market Square was beautiful at during the day and at night – it reminded me of Paris a little – with a lovely local market which was on everyday, all day during our stay. Saying goodbye to Rachel and my spontaneous adventure from Prague to Krakow was really sad. Sad to say goodbye to new friends and sad to say goodbye to a new level of freedom I had felt, if money was no object I would have happily continued. I would go back to Krakow in a heartbeat. It is a beautiful city with so much to offer, so much to do but also completely laid back, with a fantastic restaurant and cafe culture, perfect for people watching and relaxing. There were a lot of things we didn’t get to do while in Krakow – mainly because the two of us are hopeless at forward planning – and that alone entices me back. Krakow is beautiful and it opened my eyes to just how wrong people’s opinions of Eastern Europe are. I am so glad I took Travelekspert’s advice and added it on my travels, I’m just sorry we didn’t get to try all the awesome recommendations you gave us! I’m glad you liked this post! It is such a beautiful city i hope you get a chance to visit!